Tuesday November 28 @ 1pm-7pm, Ongoing throughout the day-drop in! 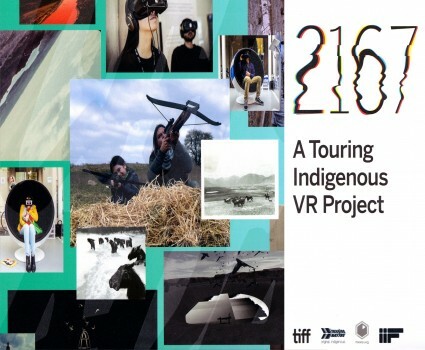 2167 : is a virtual reality project commissioned and produced by TIFF, ImagineNATIVE, Pinnguaq and the Initiative for Indigenous Futures. As part of TIFF’s sesquicentennial initiative Canada on Screen, five Indigenous filmmakers and artists: Jeff Barnaby, Danis Goulet, Kent Monkman, Scott Benesiinaabandan, and the interdisciplinary arts collective Postcommodity — were commissioned to create VR projects envisioning Indigenous life 150 years in the future. Three of these works premiered at TIFF Bell Lightbox in June 2017, and the remaining works were presented during the ImagineNATIVE Film Festival in October 2017. Canada on Screen is made possible by presenting partners the Government of Canada, the Royal Bank of Canada and the Government of Ontario, and supporting partner Telefilm Canada. 2167 is supported by The Government of Ontario, the Canada Council for the Arts, the Harbinger Foundation, the Social Sciences and Humanities Research Council, the Trudeau Foundation, and the Concordia Research Chair in Computational Medea and the Indigenous Future Imaginary.